Agile Results is a simple time management system for achievers. Getting Started with Agile Results walks you through the approach in a snap. 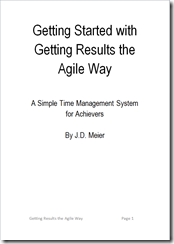 Agile Results is a system to help you be YOUR best. By figuring out what to do, you set the stage for meaningful results. This is all about slowing down to speed up. This also reiterates the idea that less is more. Rather than spread yourself thin, the idea is to focus on what really matters to you, and create meaningful experiences. The Getting Started with Agile Results Guide is a short guide (14 pages) to help you get up and running fast. Take it for a test-drive and get the system on your side. Share it with friends, family, and whoever you want to help get more out of life and put the system on their side, too.